Clams casino is a regional favorite in this neck of the woods. What is not to love about any dish made with bacon, peppers and wine? But why should clams be the only ones invited to the casino? 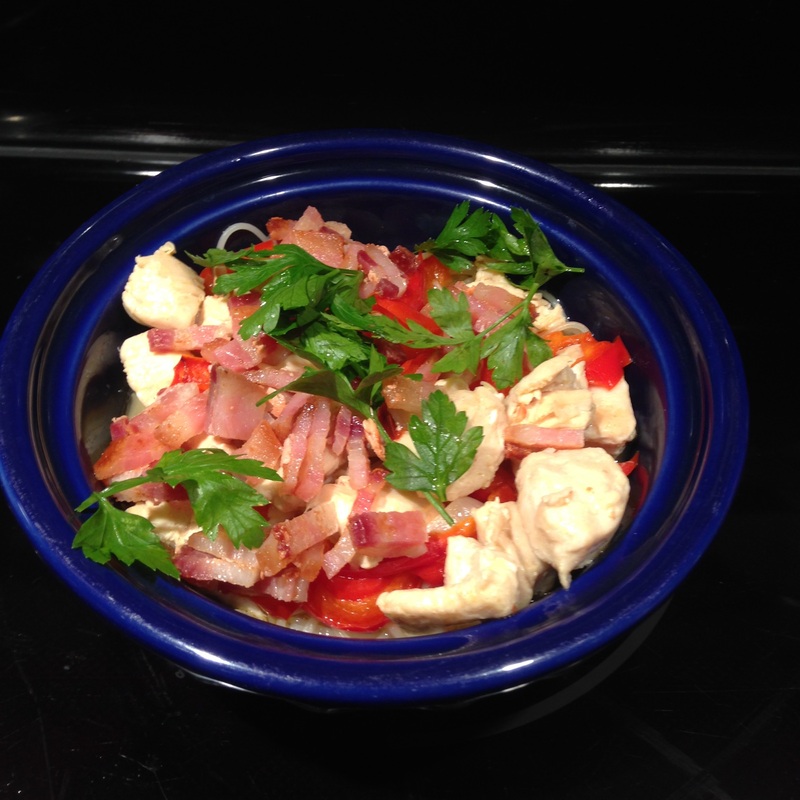 Chicken is a delicious casino variation and tastes oh-so-fine over capellini. So, all you clam haters, this one’s for you! Before you get started, roast the peppers in the oven. Try about 15-20 minutes in an oven preheated to 350 degrees F. Take a peek around the 10-minute mark to make sure everything’s on track and then set your timer for 5-10 more minutes. Now, cook the bacon. Set aside on paper towels, cool, then chop or crumble finely. Don’t get rid of all the bacon drippings! Reserve enough to barely coat bottom of skillet. This would be a fine time to set a large pot of salted water to boil for your capellini. Meanwhile, add about a tablespoon of olive oil to the skillet. Add chicken and cook till no longer pink. Remove chicken and sauté the garlic and shallot. You know the drill—don’t brown it! Add chicken broth, white wine and lemon. Add capers and roasted peppers just to get them warmed up and incorporated. And for those of you who are clam fans, check out the original clams casino capellini alla Speranza!